I feel like a terrible "foodie" in OC for not having been to LUCCA Cafe sooner. I mean, I have seen Chef Cathy compete in the Chef Competition Demo #1 for the Golden Foodie Awards and at the Golden Foodie Awards themselves but had yet to introduce myself until recently via the power of images. Duc had taken some amazing shots of the food at the Golden Foodie Awards so of course, we had to share! 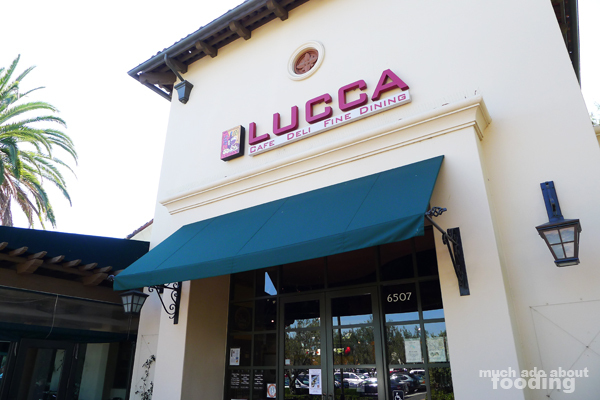 Naturally, with the food pictures being so tempting, we also had to go visit LUCCA Cafe. The interior is quite nice. We went in on a Saturday for lunch which was apparently one of the slowest times they have in the restaurant. The menu was European bistro-style, and the decor inside quite inviting. I loved seeing all the wine offerings, and Duc even complimented on the wine bar and selection. 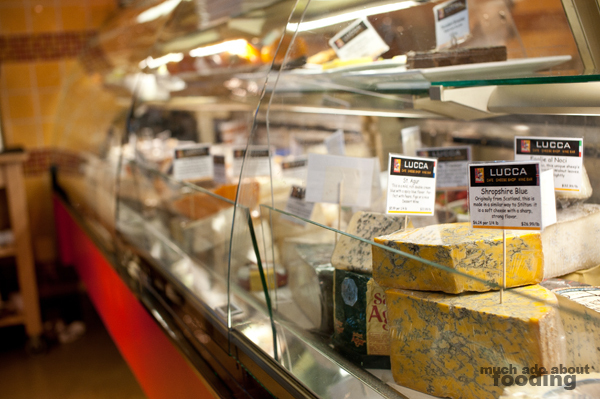 There was even an artisan cheese shop on the side and charcuterie with both imported and domestic products. It was too bad we saw it after being stuffed with our meal or else we would have bought some right there! 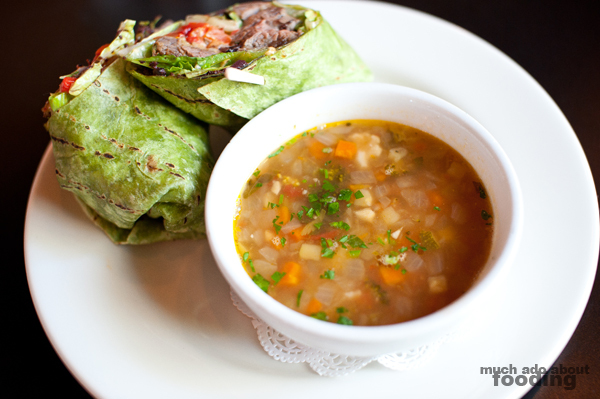 To start off, Duc decided to go with the Daily Lo-Carb which was an Italian Beef Melt (certified Angus beef, melted Provolone, olive tapenade, roasted peppers, artichoke hearts, oven roasted tomatoes, Romaine lettuce, and sundried tomato aioli in a spinach wrap). This came with the soup of the day - minestrone. We went through that soup fairly quickly. 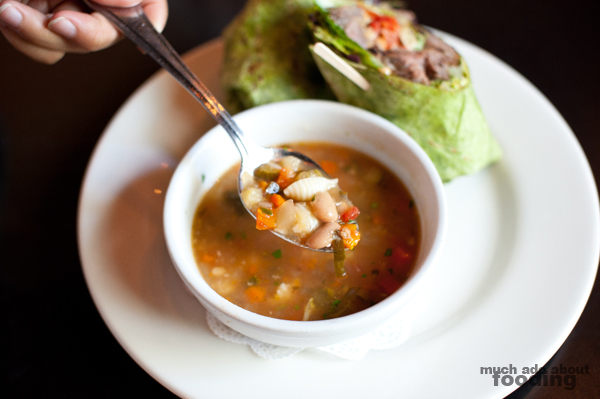 Minestrone is one of my favorite soups but I find that restaurants tend to botch it fairly often by making it too salty and heavy on just tomatoes. This one, however, was probably the best I've had in a long time as it had a hearty helping of a variety of vegetables including onions, carrots, tomatoes, and beans. The freshness shone through very well. 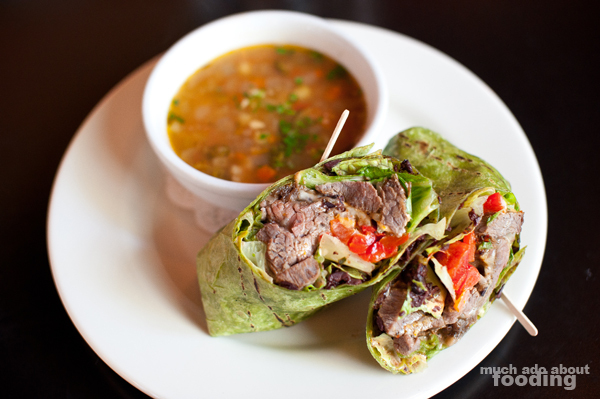 The wrap was very well-liked by Duc for the tender meat, sweetness of the roasted pepper, and tartness from the tapenade and artichoke hearts. Give this one a try some day! Our waiter, Adolfo, was very helpful and happened to recommend what I wanted to give a shot - the "Sunday Sauce," which is apparently one of their most popular. With good reason! 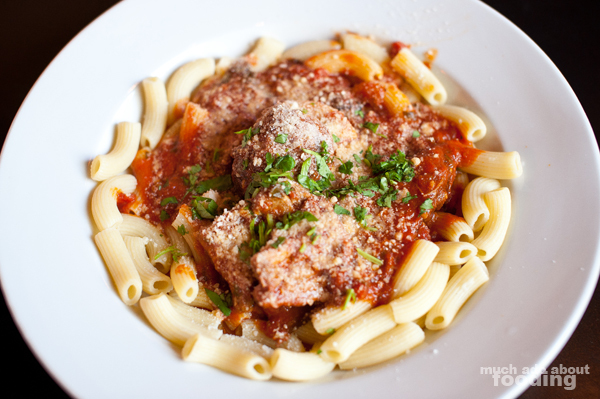 Described as "Grandma Bottari’s original rich Meat Ragu with Lucca Meatballs and Italian Sausage served with Penne, then dusted with Parmesan Cheese. The same way she served it for more than 70 years," this was a feel-good dish with firm housemade pasta, a flavorful ragu, thick and wholesome meatballs, and nice touches with the fresh herbs. 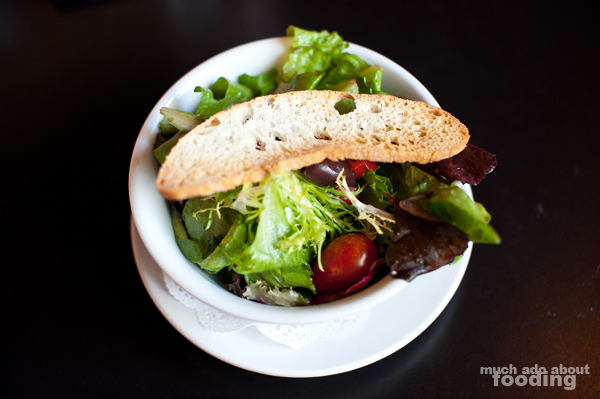 My starter was their side salad, a varied bunch of greens tossed in a balsamic vinaigrette. 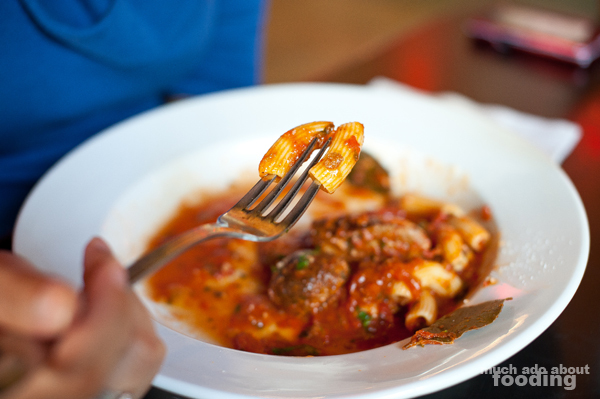 Duc found it funny how I tend to eat penne pasta so he snapped a shot of it (I use the fork tines!). 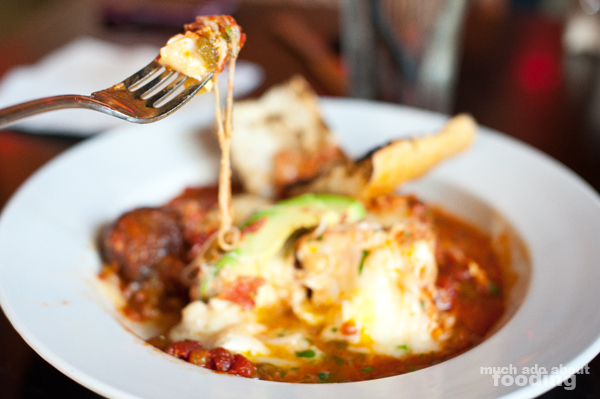 So here we were bursting when the gracious chef decided we ought to give their Eggs in Purgatory a shot (two cagefree eggs coddled in spicy tomato salsa, topped with cheeses and avocado and served over breakfast potatoes, with blackened baguette toast on the side). She explained to us how this was a rendition of a comfort food dish her grandmother used to make on Sundays after church, making sure to use a lot of potatoes to cut into just how spicy the sauce was. The modern spin included the avocado and cheese which I found quite fitting. Both Duc and I dug quite heartily into the plate despite our bulging abdomens because it was such a comforting dish to have - the flavors in the salsa really did combine well with the thick potatoes underneath. I loved watching the eggs ooze out into the sauce once we broke through their soft whites. 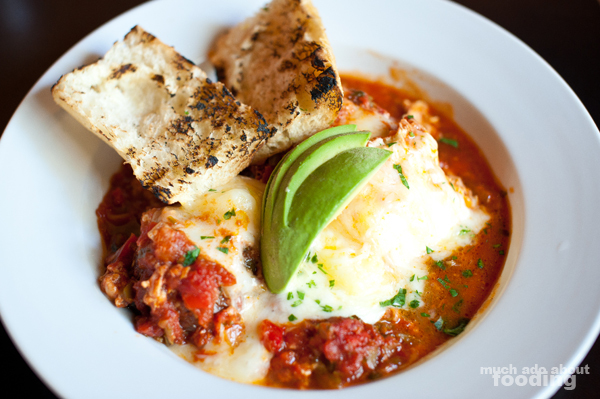 Get it on their Weekend Brunch menu and you will NOT regret the choice. 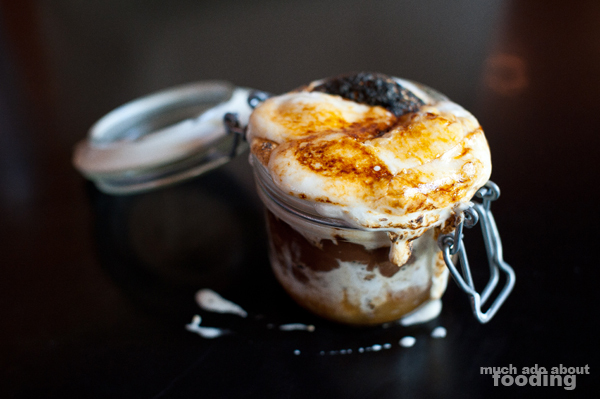 Lastly, a decadent S'mores in a Jar awaited us for dessert. Who comes up with all of this?! It was a daunting dessert at first because the slightly burnt marshmallow top was billowing over the jar as we stared at the layers beneath. You need a second stomach for this one and definitely a sweet tooth. I highly recommend this blast into your childhood past if you're into indulgences! We're so eager to come back and see the dinner menu now - hope you'll give them a shot too. Their food is from scratch, fresh, and seasonal so the menu's always changing. Keep that in mind for your visit!